Since my bariatric surgery my life has never been the same. People I've known for years have a hard time recognizing me because the change has been so dramatic. One year after my bariatric surgery I lost over 106 pounds. It was the best decision I could have made for my life. I have more energy, self-confidence and happiness now that I'm in control of my weight. Never would I have expected to look forward to stepping on the scale - there's no fear now. I know how to live my life and be in control of how I eat and exercise. When I go out to lunch I understand eating the whole plate isn't worth it. Portioning is so important! Because of my success after bariatric surgery, one of my close friends made the decision to choose it for herself as well. It's encouraging to see how my life has affected others around me for the better. There's no greater feeling! 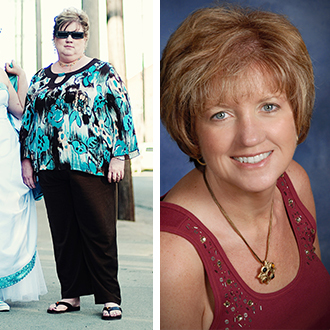 The help I received from the Central Ohio Bariatrics team made the difference in my life. I know that I've changed for the better, and I love it! I have no doubt in my mind that Dr. Custer saved my life, twice. For Dr. Custer and his team it's just another day at work, but my life has changed profoundly. At my peak, my weight was 415 pounds. 30 days before my bariatric surgery I followed the program provided for me and lost 29 pounds before surgery. My surgery weight was 386. My nerves were very high on surgery day, but it went well and my recover was just fine. Six months after my surgery I lost an additional 144 pounds, which brought my weight down to 242 pounds. I have thankfully remained at that weight to this day! I am quickly approaching my 3 year anniversary date. After surgery I have much more energy, I'm very active walking each week, and I'm now able to work on remodeling projects in our home. I feel as if I'm 30 years old again at age 55. I take no sugar medication but still take blood pressure and cholesterol meds since I had the stent put in the year before my gastric bypass. I guess that's a small price to pay for my years of being overweight. At my modest age of 55, I am in the best health of my life! It still amazes me how fast the change was and how the weight just disappeared. I could never adequately repay the Central Ohio Bariatric team for giving my life back to me. It has meant everything! Prior to surgery, I was 46 years old and could hardly get through a day. I took over 20 pills daily due to hypertension, acid reflux, arthritis, fibromyalgia, Sarcoidosis, migraines and gout. I was so sick I couldn’t even help around the house, leaving all the responsibilities to my husband. I could barely get through the day at work. I was in constant pain with no energy. I had the Roux-en-y gastric bypass surgery on May 19th, 2009. My pre-op weight was 270.2 and now my current weight is 148! I’m so thankful, encouraged and happy! Because of my surgery, I am no longer taking any of the medication I used to take daily. None! Before surgery I had doctor’s appointments almost every other week. Now I’m only going every six months for routine checkups. I can take care of my own home, have a new puppy and exercise is part of my weekly routine! Most importantly I have the joy to play with my four grandsons. There’s no greater feeling than to have the freedom to roll around on the floor with them! As I look back I can see I was successful because I took the changes seriously that Dr. Custer and his team asked me to do. The surgery was the beginning. The support, encouragement and knowledge I received afterwards made the difference. To this day I still drink 64 ounces of water and watch my portions - a way I would have never dreamed of living before! “Dr. Custer at Central Ohio Bariatrics has helped me be able to walk more, have more energy, ride a bike, enjoy playing with my kids, and I can even do sit-ups and exercise now! If you are thinking about weight loss surgery, my advice would be to make sure you go to all the classes and meet with other people who have had the surgery. It helped me tremendously. The Central Ohio Bariatrics team were amazing!” - Cindy H.
Do you have a testimony you want to share? Share it here. At Central Ohio Bariatrics, we'd love to use your story to inspire others. Larissa, Richard and Sharon have inspired us and our hope is that by sharing your story, others will make the lifestyle change as well. If you've previously been a patient of ours and are interested in sharing your story, please contact us. If you are thinking about this as a lifestyle change, we'd like to hear from you as well.